I still don't know how I survived these months without your music. Yay!! Finally new releases! Been looking forward to get my hands on these sets! And I know we won't get disappointed since you haven't made a single half good-half decent mix yet! 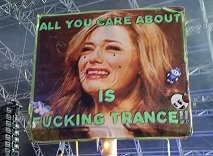 You rule and I love your trance style! mmaaaannn, iveb een waiting for these mixes for so longgg. Thx you guys and happy new year!! What a fantastic set is that, please??? Salient, dreamy... I LOVE IT!! !